Broadband News » Entertainment » Is Google Play Music All Access Worth Paying For? Google Play Music All Access is a new streaming music service. It allows unlimited listening access to millions of songs and is $9.99 per month, but you can also try it for free for 30 days (it’s absolutely worth it at this time). Keep in mind that iTunes Radio is still a few months away, so after iOS 7 releases this fall, we will see what the comparisons are like. 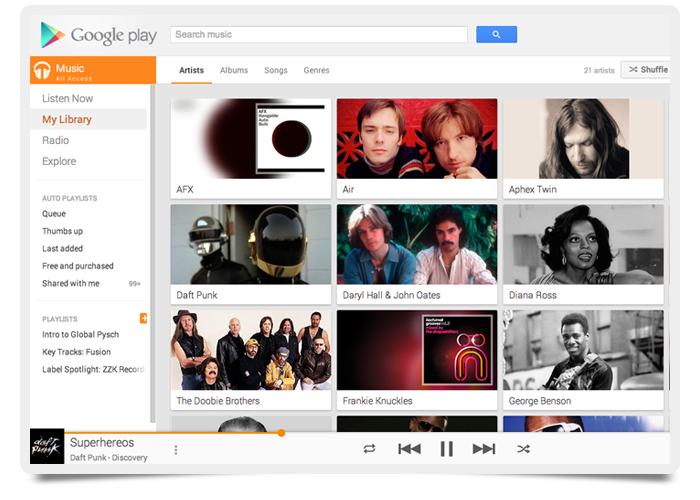 What’s Different About Google Play Music? You can create personalized radio from any song or artist, as you can with Pandora, and listen to radio with unlimited skips. What Google Play has that other music streaming services don’t have is storage. You can upload your own music or buy from the Google Play library, which is a nice plus. Everything from the sound quality to the user experience is exceptional. If you’re a Chrome or an Android user, you’re in heaven. Once you pick a few artists or albums, Google Play Music really starts working. Your home page becomes a selection of records, similar to an iTunes library or Rdio playlist. Select My Library, and every artist is listed in alphabetical order with a nice image in each selection. In the header are Artists, Albums, and Songs. If you pick the Albums header, all of your Albums are listed randomly. If you pick the Songs header, you get a Spotify-like list in alphabetical order. Google Play music has a Radio feature and an Explore feature, as well. Radio is by artist, or genre, and is similar to Pandora in design, although some might argue that Pandora is a bit more advanced with its music selections. Explore is also great and similar to Songza. Users compile Playlists, which are pretty good in taste and selection. In addition, with Chromecast, your Google Play account can now stream to your TV (that alone justifies the monthly fee). Is Google Play Music All Access the Best Streaming Service? As far as music streaming services go, Pandora and Spotify are better. Spotify has more tracks available (more dance, hip-hop, world, indie tracks) and some may argue that Pandora has a better radio selection experience. While Google Play has some room for improvement, what makes it worth the monthly fee is very similar to why you loved (back in the day) your favorite record stores. Some record stores have the best dance music and some have the best reggae and world music. But you like both, so you buy from both. Having Google Play, Spotify, Rdio, and Pandora subscriptions just opens up more streaming for your library. That’s nothing but a good thing for music lovers.